Cynthia WoodA lot’s happened with Mark Eitzel since he last set foot on a Toronto stage. That would have been back in April 2008, when he was leading the reunited American Music Club on tour in support of their second album of the 21st century, The Golden Age. The American Music Club machine slowly wound down again and was officially declared on indefinite hiatus again by Eitzel last Fall, and he also released a couple more solo records in that time: Klamath in 2009 and Brannan Street the following year, both low-key in both presentation and distribution. Oh, and last Spring he had a heart attack (but is okay now). But as has been the pattern over a career that has swung from the cultiest of cult artists to getting a modicum of the respect that his songwriting talent deserves, Eitzel again appears ready to step a little more into the spotlight. His new solo record Don’t Be A Stranger is coming out on Merge, who rightly believed those two AMC reunion albums deserved to be shepherded into the world, and Eitzel is undertaking what he’s dubbed “The Warm Gentle Rain Tour”, which will traverse North America and bring him to the Rivoli in Toronto on November 28, tickets for that $15.50 in advance. 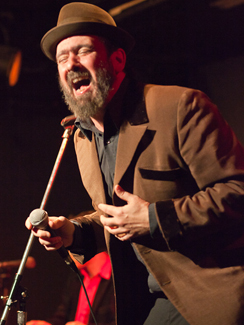 It’s hard to say what form the show will take, be it solo or with a band, but when I last saw Eitzel at SXSW 2011, it was just him and a keyboardist and he was singing AMC songs lounge/cabaret-style, so it could really be anything. What is certain is that it will be hilarious, depressing, and excellent. After all – the promotional campaign for the record involves Eitzel getting career and performance advice from the experts on video; there’s clips of him consulting with Lady Gaga’s make-up artist Billy B. and at Gawker, you can watch him discuss his lyrics with comedienne Nadya Ginsburg. Yes, hilarity ensues. GQ, The Chicago Tribune, and Spinner talk to Bob Mould about what has turned out to be the year of the resurgence of Bob Mould. Gothamist and Newsday talk to Greg Dulli of The Afghan Whigs, finally bringing their reunion tour to The Phoenix on October 3. Consequence Of Sound, DIY, NOW, and Clash all talk to members of Dinosaur Jr about their new record I Bet On Sky. They’re at Lee’s Palace on Monday, Tuesday, and Wednesday of next week. Exclaim has specifics on the third Guided By Voices album of 2012, The Bears For Lunch, out November 13. Salon, NPR, and Stereogum talk to Aimee Mann about hew new record Charmer, from which she’s just released a new video that has a few guest stars you might recognize and is a shot-for-shot remake of a video you might recognize if you’ve been following Aimee’s career from the outset… Don’t worry, I’ll help you out. You’re welcome. Aimee Mann is at The Danforth Music Hall on November 6. DIY, NOW, The Quietus, and Billboard all want to talk Shields with Grizzly Bear. They’re at Massey Hall on September 26. Cat Power goes blonde zombie-fighting road warrior in the first video from Sun. Of course. She’s at The Kool Haus on October 20. The 405, DIY has a feature and The Line Of Best Fit a video session wtih Band Of Horses. The Lab sends Saturday Night Live and Portlandia‘s Fred Armisen to interview St. Vincent, while The Montreal Gazette talks to both her and David Byrne. They’re at the Queen Elizabeth Theatre tomorrow night. The AV Club talks to Jeff Tweedy of Wilco, and his right-hand guitarist Nels Cline will be at The Great Hall on November 2 as part of this year’s Sleepwalk Guitar Festival. Dum Dum Girls are streaming their new EP End Of Daze over at Stereogum. It’s out next week, and Houston Press talks to Dee Dee about it. Titus Andronicus have unveiled the album art and first lyric video from their new record Local Business, coming October 22. See the art at Pitchfork and hear the first song from the new record below. Trespassers William have released a video from their farewell compilation Cast. Hospitality has released a new video from their self-titled debut. NPR and Spoonfed chat with Calexico. Check out the latest video from The Kills’ Blood Pressures. I speculated that The Killers’ show at the Sound Academy this weekend was a precursor to something bigger, and I was right. Las Vegas’ favourite sons return for a show at the Air Canada Centre on December 15, tickets ranging from $39.50 to $65.00. A Place To Bury Strangers have a new video from Worship. Benjamin Gibbard – he’s only Ben when he’s in a band, apparently – discusses his solo album Other Lives with Stereogum. It’s out October 16 and he’s at The Danforth Music Hall a couple days earlier, on October 14. Magnet welcomes Beachwood Sparks to their website editor’s chair with a Q&A. You Me & Charlie interviews Josh Tillman of Father John Misty. He plays Lee’s Palace on October 27. The Quietus interviews James Murphy. Frank YangLast week turned out to be a pretty spectacular week – weather-wise – for a festival. Good thing that Toronto had one. Or four. At least three. In any case, I was focused on NXNE; anything else going on in the city were just obstacles to be navigated around – literally. The relatively lighter Wednesday night of the programme meant that there’d be less need for club-hopping, though, and one could ease themselves into the festival grind gently. “I’m 23 and I’m scared shitless”. That’s how Carmen Elle, the guitar-slinging/lyric-singing half of Army Girls introduced their set at Supermarket, and you were just going to have to take her word for it because if you were looking for some evidence of those frayed nerves in their performance, they were nowhere to be found. As much as I go on about this band, I actually hadn’t seen them live since last October, and as good as I thought they were then the heavy playing and touring they’ve done since then – they just finished up a North American tour with PS I Love You – has made them even better. Exceptionally tight with a side of jam, Elle performed with poise and verve, the only thing better than seeing them live again was hearing all the new material in the set. Only two songs from their Close To The Bone EP made it into the set – and were highlights, sure – but the new material arguably demonstrated more songwriting range without sacrificing any of the punch. But the best takeaway on the night was Elle’s declaration that they were planning to release not one but two albums this year; I’ve heard such ambitions from other artists before and will believe it when I see it, but for as long as I’ve been saying that Army Girls have what it takes to be as big as they want to be, it seems like they finally want it. Look out. The next and last stop of the night was The Drake Underground where the lineup guaranteed plenty of buzz, if not quality. First up was Virginia’s Eternal Summers whom you could be forgiven for assuming was a hazy post-chillwave outfit, but who in fact were a decidedly loud, faintly angry, garage-bred power trio specializing in what you might reference as surf-gazey, sonically youthful noise. And while I hate myself a little for writing the previous sentence, I’m sticking with it. They weren’t necessarily the most charismatic performers, but it certainly sounded good. Their new record Correct Behavior isn’t out until July 24, but that still leaves plenty of Summer – if not an eternal amount – for it to enjoyably soundtrack. The Singing Lamb and We Love DC have interviews with the band. The first thing I noticed about Montreal’s Mac DeMarco was that they exceeded the Surgeon General’s recommended allowance of baseball caps in a band; three of four is just unacceptable. Musically they were fine; their smooth, yacht/lounge rock was hard to actively dislike and with a SXSW-calibre schedule for the week ahead – this was the first of something like 10 shows – and claiming fatigue from the trip into town, some laying back and clearly uncharacteristic sloppiness was allowable, but it was certainly easy to not dig the overt bro-ness of the band. Belching into the mic? Yeah, no. Toro has an interview with DeMarco. Given the number of influences and styles name-dropped in reference to Italian-in-New York Mauro Remiddi’s Porcelain Raft and his debut Strange Weekend, I would have expected something decidedly more experimental but the live two-piece – Remmidi and a drummer/multi-instrumentalist – were much more about big, crescendo-friendly dance pop with a distinct European accent, which was also cool. Their songs may have been built on a base of samples and loops but they were defined by the guitars, drums, keys and vox – all pretty conventional and also pretty pretty. Engaging at first, the set seemed to lose form somewhat as it progressed, but that may have just been me taking their song “Put Me To Sleep” a little too close to heart. After their set, I checked out. It was going to be a long weekend. Welsh singer-songwriter Cate Le Bon, whose Cyrk garnered glowing reviews on its release earlier this year, will be releasing a second album from those same session entitled Cyrk II on August 20 and accompany it with a North American tour – she’ll be at The Rivoli on September 18. The long-rumoured David Byrne/St. Vincent collaboration is not only real, it has a name – Love This Giant; a website – LoveThisGiant.com; a first MP3 – “Who”; and a tour – look for them at the Queen Elizabeth Theatre on September 20. Morrissey may be sticking to his guns on not playing Canada until we stop eating any meat and wearing leather, but you have to see his just-announced US tour as throwing southern Ontario a bit of a – if you excuse the metaphor – bone. He’ll wave to us from the Rapids Theatre in Niagara Falls on October 19; you might say that as he continues to ignore us, this is as close as he’ll get. Maybe make a road trip of it, hit the Anchor Bar for some wings. A track from Metric’s new album Synthetica is available to download. Also now yours to take home – the first single from Grizzly Bear’s still-untitled forthcoming album. It’s out September 18 and they’re at Massey Hall on September 26. Sympathies to the friends and family of Radiohead drum tech Scott Johnson, who died in the stage collapse on Saturday and best wishes to those injured. And further sympathies to the friends and family of former American Music Club/Sun Kil Moon drummer Tim Mooney, who passed away on the weekend. There’s remembrances from his bandleaders Mark Eitzel and Mark Kozelek, and donations to his family can be made via PayPal. Rateyourmusic.comA lot of folks were surprised when Nashville’s Lambchop returned with their new record Mr. M last week. Not because it was great – that’s pretty much the baseline for anything that Kurt Wagner and cohort release – but that it happened at all, many assuming they’d quietly called it a day after 2008’s OH (Ohio). But as surprise comebacks go, it doesn’t hold a candle to the return of San Francisco’s American Music Club, who against all expectation reformed in 2003 after a decade apart and with frontman Mark Eitzel having cultivated a relatively fruitful solo career. The AMC reunion yielded two very good albums – Love Songs For Patriots and The Golden Age and a goodly amount of touring before apparently being put back into mothballs. Alas. In the midst of their first hiatus, American Music Club got what all revered yet underappreciated bands get and that’s a tribute album – Come On Beautiful: The Songs Of American Music Club collected a bevy of artists who may have been small names circa 2001, but would go on to much larger things – including Lambchop. Kurt Wagner, on the band’s artist page on the compilation website (still up!) talks about how he initially didn’t care for AMC but came around on them. And in the present day, he talks to The AV Club about Mr. M.
Frank YangSome shows you want to see in a packed, sweaty club. Others you don’t. In the case of St. Vincent, more than two years removed from her last visit to Toronto, you’ll take her anywhere you can but as much as I love the Horseshoe Tavern, its sweltering environs on Saturday night weren’t what I’d call the ideal setting for Annie Clark’s elegant pop and its Jekyll-and-Hyde/frosted miniwheat balance of beauty and abrasion. The band did what they could to dress it up, hanging white drapes across the back wall and setting up some dramatic lighting, but something more akin to a church or theatre would have seemed more appropriate. Or perhaps just somewhere with more effective air conditioning. Opener Gentleman Reg has been somewhat ubiquitous on Toronto stages since the Spring release of his latest record Jet Black, but considering the length of the layoff between it and 2004’s Darby & Joan, he can be forgiven for making the most of the opportunity. Reg Vermue has always had a gift for blending folk and pop, but I’ve felt he needed the proper backing players for his songs to properly shine – an opinion that was shared, apparently, because the band that he’s assembled for Jet Black really hits that sweet spot, though I’m not sure if the players on the record were the same ones on stage with him on Saturday – I don’t have the proper roster notes to comment. Either way, the balance of feyness and punch on display this evening seemed just right and it was good to see Reg settled so comfortably in the role of frontman. I’d missed numerous opportunities to see him play throughout the Summer – glad to have finally rectified that. As distinctive as Annie Clark’s creative vision is, live she’s also much-defined by her band, or lack thereof. The first time I saw her in February 2007, she was supporting Midlake and operating solo, and as such made heavy use of looping pedals and a Stompin’ Tom-approved board for percussion. The next time in Austin that September she’d expanded to a power trio format and though that configuration sounded a little more conventional, it freed her up musically. This time, she was fronting a five-piece St. Vincent complete with utility players tasked with handling a myriad of instruments including guitar, bass, keys, violin, saxophone and clarinet – obviously ready to do the orchestrations and textures of Actor justice. And the presence of those extra players made a world of difference in recreating the new material, of which the set list was mostly comprised (as well as the solo cover of “Dig A Pony” which again seems to be a set staple). It’s hard to imagine “Marrow” or “Black Rainbow” without the trill of the woodwinds and brass, but there they were, adding crucial accent to Clark’s crystalline voice (or chorused/delayed/voice when she sang through her second mic) and then getting gleefully obliterated when she went in for a fuzzed-out, shred-happy guitar break. And it was that wanton and wonderful collision of beauty and brutality, punctuated by Clark’s charmingly off-kilter banter, that defined the evening. That and the stifling heat. Panic Manual and eye have reviews of the show. The Globe & Mail has a feature interview with Annie Clark while Renegade Bus has an interview with Evan Smith, one of the backing musicians who makes St. Vincent a band and not just a pseudonym. Here’s some news – St. Vincent’s one-time bandleader Sufjan Stevens has announced the details of his previously-implied Fall tour, and it’s a small one. As in venue. Though he could easily fill rooms two or three times the size for his first local show in four years, Stevens is opting for a club tour and will return to Lee’s Palace on October 1, where he played last in November 2004. Contrary to previous speculation, this show will not be in support of the BQE show/soundtrack coming out October 20, which raises the question not only of what material will be aired – a melange of Illinois, Michigan and Seven Swans seems most likely – but what the theme of the costumes will be. There had better be costumes, Sufjan. Don’t you be going sensible on us. Support for the tour will be Cryptacize, and tickets will be doled out very carefully. Ticket details are forthcoming later this week, but they will go on sale Satureday and be limited to two a person with them only being available to be picked up at the venue the night of the show. But you know that they could also insist that patrons have to eat a jar of flaming cockroaches before being admitted and Lee’s would be packed before 8PM. Flavorwire talks to Dean Wareham of Dean & Britta. Pitchfork has a feature on Antony Hegarty of Antony & The Johnsons. Their new Aeon EP was released last week. Mark Eitzel has revealed details of his next solo record, entitled Klamath and due out this Fall. Work is also beginning on a new American Music Club record. Those holding their breath for the release of Final Fantasy’s Heartland can circle January 5, 2010 as a date to exhale. Owen Pallett revealed via Twitter that the record would be out the first week of the new year, and that’s the Tuesday of said week. Also noteworthy is that he has signed with Domino Records to release the album worldwide, though Blocks will presumably continue to handle things in Canada. Victoria Bergsman will release her second album as Taken By Trees in East Of Eden, due out September 8. The first MP3 from it is available to sample and there’s a feature piece at National Geographic that follows Bergsman to Pakistan where she recorded the new record. Paste reports that Built To Spill’s next album There Is No Enemy has finally been given a release date of October 6 – that’s the same day as night one of their two-night residency at Lee’s Palace in Toronto. DCist, The New York Times and The Valley Advocate talk to Joe Pernice about his new book and album, It Feels So Good When I Stop. He’s at the Dakota Tavern on September 24. There’s now some context for Thao with the Get Down Stay Down’s upcoming November 1 show at the El Mocambo – she’s releasing a new album in Know Better Learn Faster on October 13. Details at Blurt.